NOTE: Review originally written for and posted at MovieByte.com. To see this post and check out the guys over at MovieByte, click here! RED, a 2010 film starring Bruce Willis, Mary-Louise Parker, John Malkovich, Morgan Freeman, and Helen Mirren, was great because it brought something new to the table: older actors, most not known for starring in action films, coming together to create an action film that works as both a good action film and as a good comedy too. However, I was slightly concerned for the sequel; could the filmmakers capture what was special about the first film without rehashing it in the second? Luckily, I think that they (mostly) pulled it off. RED 2 picks up where the first film left off, with Frank Moses (Bruce Willis) and now-girlfriend Sarah Ross (Mary-Louise Parker) trying to live a normal life together. However, Frank’s efforts to keep Sarah safe and out of harm’s way fail when the pair are sucked into a plot to find a nuclear device that was lost in Russia several years ago. Marvin Boggs (John Malkovich) and Victoria Winslow (Helen Mirren) are back to help, with a blast from Frank’s past returning as well – Katya, played by Catherine Zeta-Jones, who is described as “Frank Moses’ kryptonite.” It’s a race against the clock as the team tries to find the weapon while trying to avoid assassination attempts by “the world’s number one contract killer,” Han J0-Bae (Lee Byung-Hun). 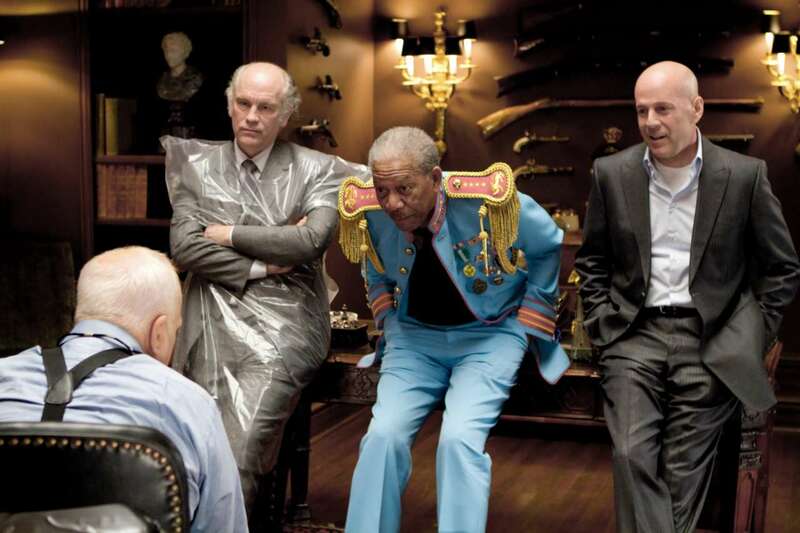 It’s nice to see the original cast return, although I must admit that Morgan Freeman’s character is a missed presence. Bruce Willis as Frank brings back a lot of the interesting back and forth of being a stone-cold killer and someone in love, which brings some more humor to the table. Mary-Louise Parker as Sarah is mostly great, but I did think that the character was a bit too over-the-top eccentric at times. Most of that, however, can be blamed on the presence of Catherine Zeta-Jones character, Katya, who I didn’t like at all. I didn’t like the rivalry between her and Sarah, which felt forced at times, such as in the car chase scene. I understand that there needed to be a reason to create tension between Sarah and Frank, but I thought that it had already been established pretty well by showing Frank’s worry at Sarah’s involvement and apprehension at her carrying a gun, something that resolved appropriately later in the film. Oh well. Anyway, John Malkovich as Marvin and Helen Mirren as Victoria are probably my favorite two characters of the film; Marvin is kooky in all the right ways, and seeing Helen Mirren firing guns out both windows of a car (see image above) is worth ticket price. Anthony Hopkins makes an appearance as well as Dr. Edward Bailey, a wonderfully quirky character who has a surprise or two up his sleeves. I was a little iffy on my opinion of him at first, but he certainly grew on me and became one of my favorite parts of the film. Very little of the humor in the film feels forced, making the conversations and interactions between characters feel natural. Many of the jokes are brought about by the different worldview that these characters have compared to normal people; for example, Marvin’s negative observation at the start of the film about how Frank “[hasn’t] killed anyone in months” or Frank’s gift of a personalized handgun to Sarah being seen as a romantic gesture. Some of the humor is even pretty tongue-in-cheek, such as when Victoria infiltrates an insane asylum by eccentrically declaring herself “the Queen of England,” a reference to Helen Mirren’s arguably most famous role as Queen Elizabeth II in the 2006 film The Queen. Composer Alan Silvestri’s score is entertaining as well, despite it being completely different than anything I’ve heard from him before. He does a great job with creating music that drives the film forward without intruding on what’s happening on-screen. I have a couple of spoiler-y dislikes that I won’t discuss here, but, in the grand scheme of things, they aren’t all that important. What IS important, though, is that, despite not being as good overall as the first film, it is still just as fun, bringing lots of laughs along the way. There is a nice twist at the end of the film that I honestly didn’t see coming, which is always nice, the stylized scene changes are well-done and appropriately comic book-esque, and it takes what was fun about the first film and does something new with it. It all boils down to this: if you liked the first film, then RED 2 is definitely worth checking out. What do you call a movie starring for elder actors who are not (aside from Bruce Willis) typically known for starring in action films? Lots of fun, that’s what! RED introduces us to Frank Moses (Bruce Willis), a retired CIA agent who is actually quite lonely. He fixes this by ripping up his pension checks so that he has an excuse to call the pension office and talk to Sarah Ross (Mary-Louise Parker), who works in customer service. The two have never met, but a relationship forms between them, leading to Frank deciding to visit her city to meet her in person. However, circumstances change when a hit squad arrives at his house to kill him; he kills them all, finds Sarah, essentially kidnaps her, and goes on the run, along the way asking for help from old friends: Joe Matheson (Morgan Freeman), Marvin Boggs (John Malkovich), and Victoria Winters (Helen Mirren). Current CIA agent William Cooper (Karl Urban) is assigned the task of tracking Frank down, but he soon discovers that Frank may be old, but he still packs a punch – he’s Retired, Extremely Dangerous (RED). The best part about this film is seeing the older actors stepping into the types of roles usually reserved for younger actors. When we’re first introduced to Joe (Freeman), he’s sitting in a retirement home, but it’s not too long before he shoots someone in the face. Likewise with Victoria (Mirren), who, when we first meet her, is wearing a plain white dress, looking every bit the part of the elder grandmotherly figure, but we soon learn that she is quite adept with automatic weapons. Both of these actors do well stepping into these atypical roles, with the twist on their typical character choices bringing much humor to the film. Malkovich plays the probably-more-than-slightly insane Marvin with a palpable eccentricity that you can see in the craziness of his eyes. Willis, who is the one actor actually known for his action roles, brings a level of touching emotion to the table that he would later bring to Looper (my review), emotion that seems genuine and surprisingly not out of place among the countless flying bullets…he pulls it off well. Older actors aside, it was nice to see Karl Urban outside of Star Trek; he plays his role with an admirable resolve, adequately expressing his character’s desire to get the job done and alongside the deep love he feels for his family. I also liked Mary-Louise Parker, an actress who I’m not familiar with, as she brought plenty of laughs to the film despite the fact that her character was mostly the damsel in distress. One thing that I noticed while watching is that the action is actually pretty minimal when you compare it to other films in the same genre, but all of the choreography here is very deliberate and purposed, making it easy to follow without dumbing it down too much. In fact, the minimal action fit in well with the idea that the characters were a bit too old for too much physical strain, making the reliance on strategy and gunfire the obvious alternative. However, the scene transitions when moving great distances were a bit weird, though the obvious intention was to emulate moving panels of a comic book, since this film is based on one. Thankfully, there was not too much done to make the look of the film feel too much like a comic book, even if the camera was occasionally a bit too dynamic for my tastes. Honestly, I liked most of the camera work in this film, with there being no apparent reliance on shaky-cam to “develop” action scenes or anything like that.